Sterling Silver Manannan's Bracelet by Metal Arts Group. Manannan, God of the sea, rode his chariot across the waves of the ocean while his home lay deep below the surface. Although at times a trickster, he was known as a protector to the Otherworld. Manannan was the last God of the Celts, left to roam while the others slept to await their time in a new era. 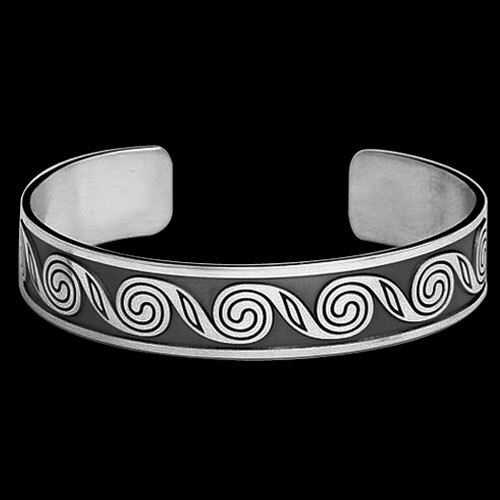 This unique design represents his journey, displaying strong interlocking and never ending spirals, rolling across the bracelet. 6.5 x 0.6 inch Sterling Silver Manannan's Bracelet by Cari Buziak. Made in USA.